A perfect fit for small mailrooms, the intimus F 7200 efficiently folds documentation for delivery. 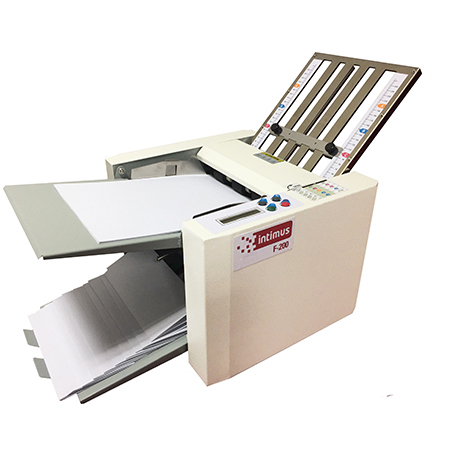 Desktop document folding machine with different folding modes. Robust metal construction for short and repetitive runs as well as peaks. Staged exit of the paper to avoid mixing of already folded pieces. Push-down feed unit with capacity for up to 250 sheets. Easy commissioning and selection of folding types with clear pictograms on the folding tray. Digital LCD display with indicators. Resettable forward and backward unit counter. 3 robust paper feed rollers. CE-certified. Push-down feed unit with capacity for up to 250 sheets and stream delivery paper ejection system conveyed by belts and four manually selectable ejection roller positions. Precise: Easy fold plate adjustment thanks to the settings overview with symbols and colour codes on the machine. Control panel: Four push buttons and the digital display with addition/subtraction batch counter guarantee an easy, uncomplicated operation. Display indicates paper errors. Durable: Robust metal construction with 3 paper feed rollers for short and repetitive runs as well as peaks. Easy storage: Feeding and exit tray can be fold away for easy transportation and storage of the machine.